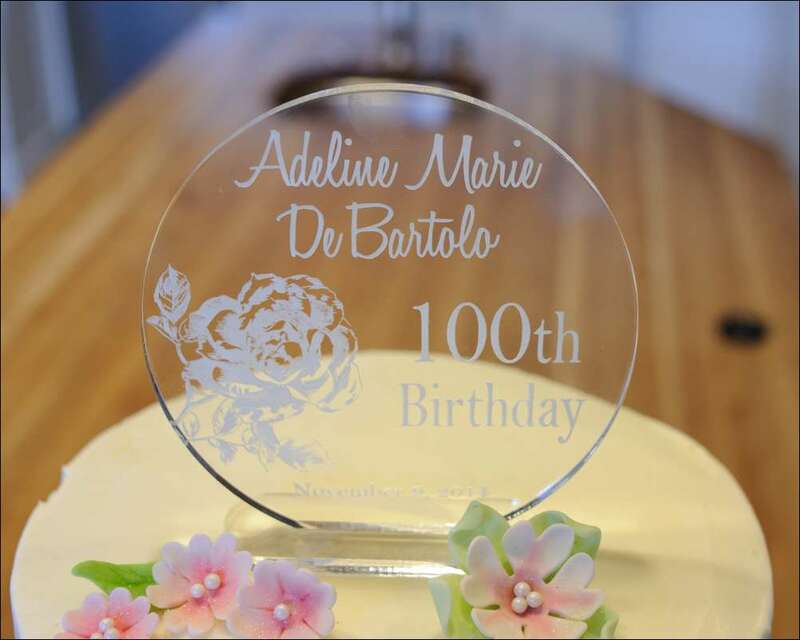 This cake was certainly a labor of love for a woman who is very dear to me….my husband’s grandmother, Adeline DeBartolo, who turned 100-yrs-old last November. She’s the reason we packed up and moved our entire household and 1-yr old son from Utah to Ohio 10 years ago and now live 2 blocks away from my in-laws. She’s the reason my kids can have the wonderful influence of their loving grandparents just down the street every day. She’s the reason, truth be told, I married my husband…Before I’d met his parents (they lived in Hawaii when we were first dating), I met Grandma and she welcomed me to the family with open Italian grandmother arms. She’s the reason for a lot of good and wonderful things in my life and I love her dearly. So when it looked as if we were going to get to celebrate her 100th birthday, I had to make the cake. 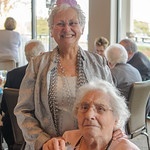 I’m finally getting around to posting this as I found all of the pictures we took in my kitchen and at the venue that day (this is Grandma with my beautiful Mother-in-Law). The party was a terrific event and friends and family came from near and far to celebrate Adeline’s long and eventful life. 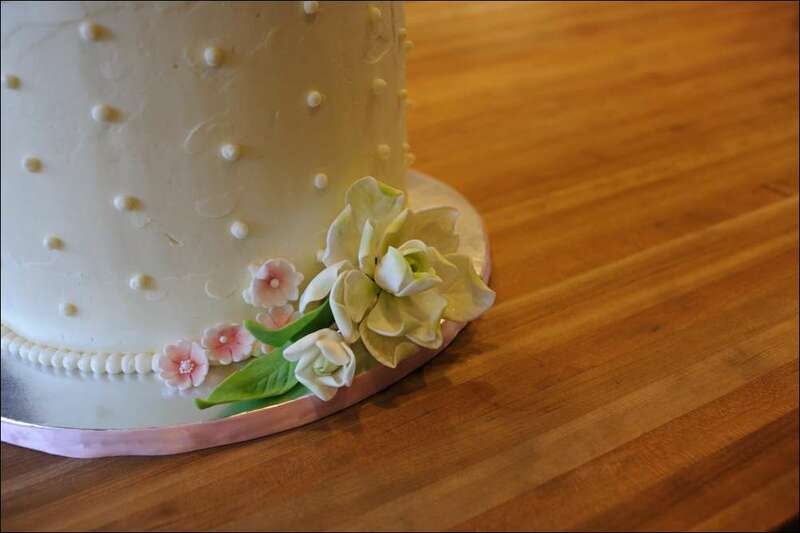 I wish I would have taken more pictures of the process, but the cake is modeled after this one from Sprinkles Bakes. When it was posted last year, I knew I had to do one like it for Grandma’s celebration. 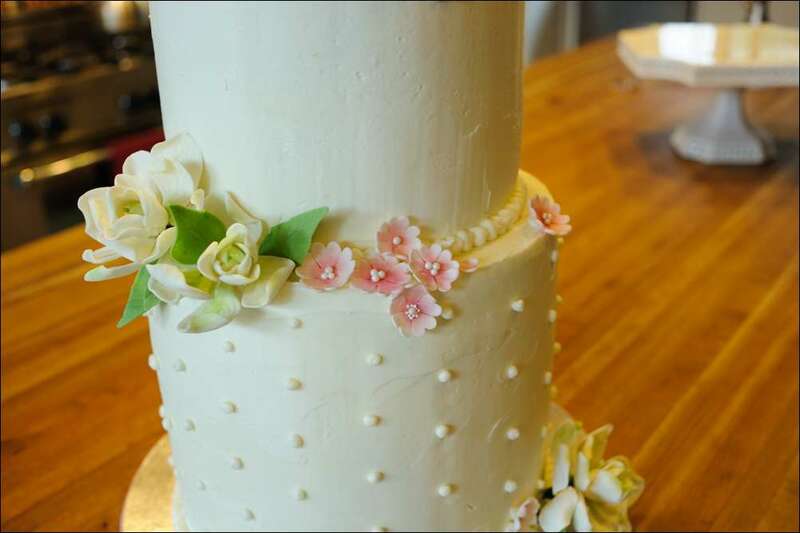 The cake is actually a 3-tiered cake, with the bottom and middle tiers both 10″ diameter and the top 8″ diameter. Each tier is 3 layers, chocolate-vanilla-chocolate with different fillings (cream cheese, raspberry mousse, chocolate ganache). The entire thing is frosted with vanilla-bean buttercream. 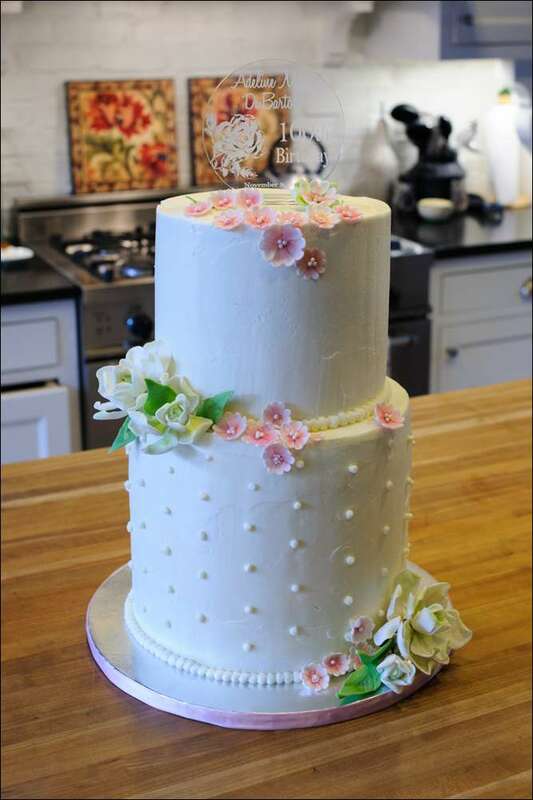 I added little Swiss dots in buttercream to the bottom two tiers and buttercream pearl borders. The flowers I made in advance from homemade marshmallow fondant mixed with a little gumpaste to make them stronger. 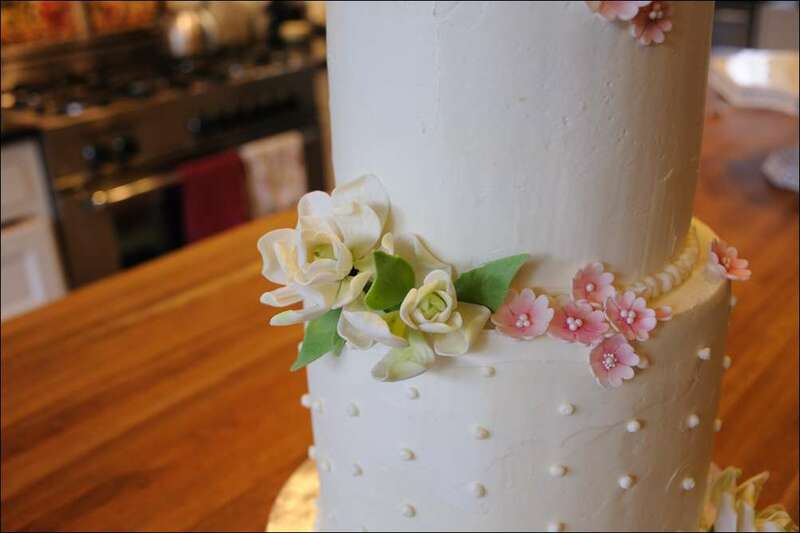 Grandma’s favorite flower is gardenia, so a did a few of those (perhaps one of the hardest to make out of fondant!) and added a few pink dogwood blossoms for contrast. 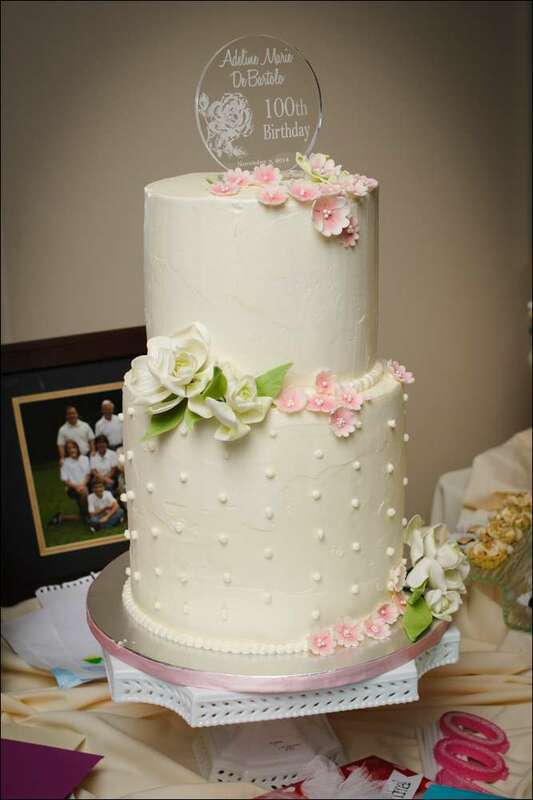 The lovely topper I got from this vendor on Etsy…It added the perfect touch to the cake. Adeline is so beloved that along with immediate family, virtually ALL of her nieces and nephews (and many great- and great greats-) drove hundreds of miles to celebrate her life. I love this series of photos showing her reaction to the cake with the candles lit (we had to put it on a cart and bring it to her as she’s in a wheel chair). 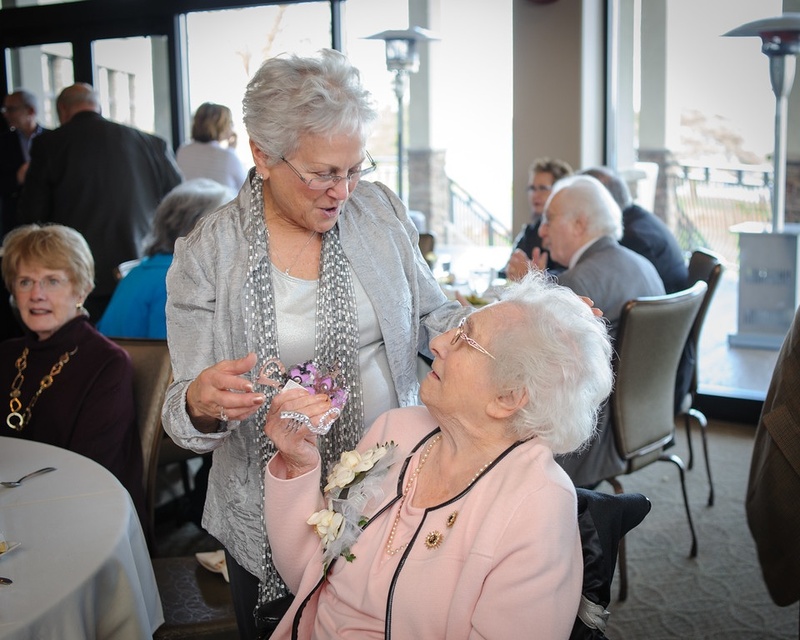 The other lovely lady in the first photo is her sister Violet (Aunt Tata to all of us), who will be turning 100 in 2 years…definitely some long-lived genes in this family! The last photo is my favorite, with all of the the youngest great-grandchildren helping Grandma with the candles (that’s me, holding up my youngest…she really wanted to see 100 candles on the cake, but was finally satisfied with 1 LONG candle for every decade ;0). It was a wonderful celebration and I was honored to be a part of it….We love you very much, Grandma, and I can’t wait to do a cake for 101!